702. The cellular or green bark succeeds to the liber. Its tissue resembles that of the leaf, being filled with sap and chlorophylle. It grows laterally to accommodate itself to the enlarging circumference of the tree, but does not increase in thickness after the first few years. 703. The cortical or brown bark. Its color is not always brown, being rarely white (canoe birch), or straw-color (yellow birch), or greenish (striped maple), or grayish (beech, magnolia). Its substance is always cellular tissue, but differing widely in consistency in different species. Its new layers come from within, formed from the green bark, while its older are sooner or later cast off. 704. The cortical layers sometimes accumulate to a considerable thickness (maple, hickory, oak), but are finally rent and furrowed by the expanding wood. In the cork oak (Quercus suber) they attain an excessive growth, furnishing that useful substance, cork. In birch (Betula papyracea) these layers resemble paper, long abiding by their elasticity the expansion of the trunk. 705. 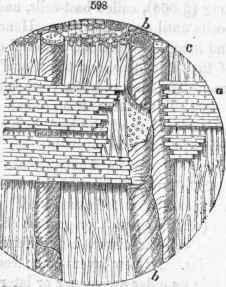 The medullary rays (medulla, pith) are those fine lines which appear in a cross-section passing like radii from the pith to the bark, intersecting the wood and dividing it into wedge-shaped bundles or sectors. They consist of firm plates of parenchyma (muriform tissue, the cell resembling brick-work) belonging to the same system with the pith. 707. The silver grain. In a radial section (597, 598) the medullary rays are more conspicuous as shining plates of a satin-like texture, called the silver-grain, quite showy in oak, maple. A tangential section shows their ends in the form of thin ellipses. 708. They serve as bonds to combine into one firm body the successive wood layers, and as channels of communication to and from the bark and heart-wood. They also generate, at their outer extremities, the adventitious buds. Buds, a mucilaginous, half-organized layer of matter. Its presence loosens the bark and renders it easily peeled from the wood. The cambium is a sap solution of the starchy deposits of the preceding year, now rapidly being organized into cells. 710. This is the generative layer whence spring all the growths of the ligneous system. 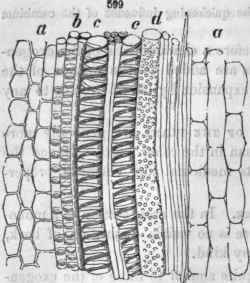 From this, during each growing season, two layers are developed, one of liber and one of wood, both at first a cellular mass, but the cells with wonderful precision transforming, some into the slender bast-cells of the liber, some into the dotted ducts and fusiform cells of the wood, some into the muriform tissue of the medullary rays. Through these latter the quickening influence of the cambium pervades both wood and bark. 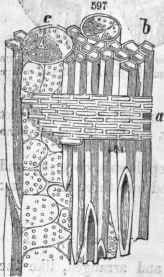 597, Wood of Oak; section longitudinal, showing, a, medullary rays; b, wood-cells; c, porous ducts. S9S, Wood of Maple; a medullary rays; bt ducts; c, wood-colls. 711. Unlimited growth is therefore a characteristic of the exogenous stem: for the yearly increments are added to the outside of the wood, and the bark is capable of expansion by lateral growth to any extent. 712. The peculiar secretions of the plant are generally more abundantly deposited in the bark than in the other parts. Hence the bark is more generally sought for its medicinal and chemical properties. 713. The endogenous structure. 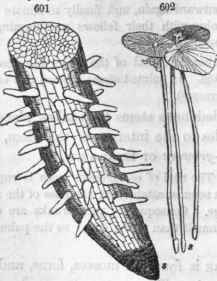 In the cross-section of amono-cotyledonous stem (corn, palm) there is no visible distinction of bark, wood, pith, or of annual layers of any kind. 714. It is composed of tissues quite similar to those of the exogenous stem, but very differently arranged. The body of the monocoty-ledonous stem consists of parenchyma, within which tissue numerous thread-like bundles of woody matter are imbedded. 715. These bundles consist each of one or more dotted ducts accompanied by spiral vessels, pleurenchyma, and often cienchyma also, variously arranged in different species. 716. The formation of these bundles is dependent upon the leaves from which they may severally be traced downwards, first tending toward the interior of the stem. Further on they recurve outward again, and finally terminate near the surface, there interlacing and combining with their fellows and forming an excessively hard but inseparable rind (false bark). 717. Cleavage difficult. From this entanglement of the fibers the cleavage of endogenous stems is difficult or impossible. In jointed stems (culms) this entanglement occurs only at the nodes (cane, grasses). 718. The growth of monocotyledonous stems thus takes place by the addition of the new wood bundles to the interior of the stem, and hence such plants are called Inside-growers or Endogens. 719. Peculiar forms of the caudex. The rind of endogenous trees is capable of only a limited expansion. This limit is soonest attained at the base of the stem long before the upper parts cease to enlarge. Consequently such trunks are often seen of equal or greater diameter at the summit than at the base: so the palmetto, corn, bamboo. 720. The acrogenous structure is found in mosses, ferns, and the other higher tribes of the Cryptogamia. The stems advance, beneath or above the ground, full-formed, growing only at the end, hence called Acrogens. 599, Various kinds of vessels in a wood-fiber of Bamboo or Rattan. a, Cells of parenchyma; b, annular cells; c, spiral vessels; (I, porous duct; e, wood-cells. 600, Section of an Acrogenous stem of Tree-Fern (Cyathea), showing the vascular bundles imbedded near the circumference of the cellular mass. 722. Thallogens are the lowest in the scale of rank, having no true axi3 and no other tissue than parenchyma, which grows in threads or in mass in all directions. The apparent stems (stipes), if any, support the fructification only (sea-weeds, lichens, mushrooms, puff-balls, frog-spittle, mildew). 723. The structure of roots presents few deviations from that of the stems to which they severally belong, being exogenous in Exogens, endogenous in En-dogens, etc In the former class the central pith disappears, its place being occupied mainly by vascular ducts, and the liber, if any, has no bast-cells. 724. The fibrilae and pileor-hiza should, however, be mentioned as peculiar in the structure of the root. The former are produced by millions, clothing the delicate epidermis of the young rootlets as with cottony down, especially in light soils. They usually consist of a single cell of the epidermis extended as seen in figure 601. They are the true absorbents, the mouths of the growing plant. 725. The pileorhiza. The microscope shows that the extreme, advancing point of the delicate, growing fibers is not thrust naked against the opposing soil, but is covered with a cap called pileorhiza (pileus, a cap, rhiza, root), which consists of older, hardened cells, behind which are formed the new cells. In the Duck-meat the pileorhiza is lengthened into a sheath. 726. The manner of growth in the root is not like that of stems, by the extension of parts already formed, but simply by the addition of new matter at the advancing point. This accounts for the wonderful facility with which it penetrates the soil and finds its way uninjured into the hardest earth. 601, Extremity of the rootlet of Maple, with fibrillae and (8) pileorhiza. 602, Two plants of Lemna minor (Duckmeat). 8, Their pileorhiza. 727. Dictyogens. In those few Monocotyledons which bear reticulated leaves (Smilax, Dioscorea), the Dictyogens of Dr. Lindley, the roots exhibit a structure resembling that of exogenous stems.